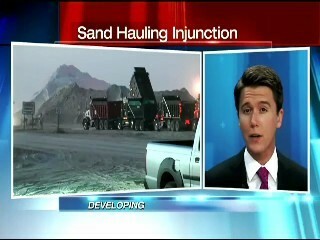 FORT MYERS, FL -- A group of homeowners' associations and businesses has filed a lawsuit to stop trucks hauling sand to a Collier County beach renourishment project from using Corkscrew Road to get there. The plaintiffs are the Grandezza Master Property Owners Association, Bella Terra of Southwest Florida, Wildcat Run Community Association, University BP, Miromar Outlet West and International Design Center - all on or near Corkscrew Road. The defendants in the suit are the companies hauling the sand and Collier County. make a left onto southbound I-75 on their way to the Vanderbilt Beach area. Planners expect to run 400 trucks a day, six days a week on the route for four months. All that work on the $9.5 million project would happen during the day. Reroute trucks to Alico Road, which they say is a less populated route, to minimize the economic and safety impacts of hauling the sand using Corkscrew Road. If they are sticking with Corkscrew Road, the suit asks the judge to force the trucks to work overnight - from 11 p.m. to 6 a.m. - so as not to impact business at the shops and the activities of residents. Finally, they'd like the trucks to use roads in Collier County, which an engineer hired by the plaintiffs says is the best solution anyway. "It's been voiced before - our main objection is the safety of our customers and residents in the surrounding communities and all the 47 school bus stops that these trucks are going by every day," said Jeff Staner, the vice-president for Miromar Outlets. Collier County says it chose the Corkscrew route because it is $700,000 less expensive than the alternatives.